After promising future support for Apple's CarPlay earlier this month, Mazda on Wednesday revealed two upcoming models will boast integration with the infotainment system, with the first set to launch this summer. Mazda's first CarPlay- and Android Auto-compatible model will be the 2018 Mazda6, the automaker's popular mid size sedan. The announcement was made during a presentation at the New York International Auto Show, where Mazda detailed a range of new cars and corporate initiatives. On Mazda6, CarPlay will be standard on Touring, Grand Touring, Grand Touring Reserve and Signature trim levels, leaving Sport as the lone trim that goes without. 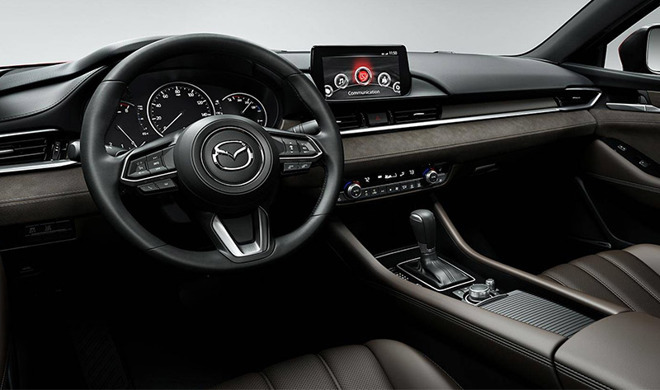 Apple's in-car connectivity interface will be displayed on an 8-inch screen running Mazda Connect, the marque's proprietary infotainment system. Introduced at the LA Auto Show in 2017, the 2018 Mazda6 is rolling out at dealerships this spring. Customers who purchase the car before CarPlay availability debuts will be able to upgrade their Mazda Connect system to support the feature. Further, Mazda this fall plans to begin sales of a CarPlay and Android Auto retrofit kit for older vehicles with Mazda Connect. The company promised retroactive upgrades earlier this month. The company failed to provide details on upgrade or retrofit costs, but the package should be in line with current offerings from other carmakers. Former Mazda partner Ford, for example, offers a CarPlay upgrade route for owners with Sync 3 infotainment systems for a nominal fee. The package consists of a compatible USB port and software enhancements. According to a press release from Mazda's Canadian branch, CarPlay will also appear in the 2019 CX9 when it arrives in the Great White North this summer. Whether the model will gain CarPlay access in other regions is unknown, but the company said the technology will roll out to its entire model line-up after its debut on CX-9. Mazda is one of the last major manufacturers to adopt CarPlay. Last week, Toyota, another longtime holdout, announced its first CarPlay model in the 2019 Corolla Hatchback, which is due to go on sale this summer.